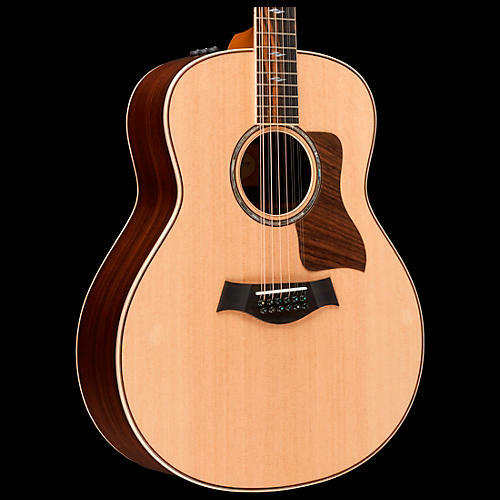 The essence of the Taylor playing experience lives within the rosewood/spruce 800 Series. With the debut of its comprehensive redesign in 2014, master guitar designer Andy Powers took what was already Taylor’s flagship guitar series and deployed an array of voicing enhancements, ranging from customized bracing and wood thicknesses for each body style to the use of protein glues and ultra-thin finish, to bring out another level of musicality. Together, these refinements deliver much more than the sum of their parts. For everyone from pros to hobbyists, they make the playing experience more expressive, inspiring and fun. The 858e 12-String Grand Orchestra comes with Taylor Expression System 2 electronics and ships in a Taylor deluxe hardshell case. The Grand Orchestra is Taylor’s biggest, deepest body shape and delivers the richest, most complex voice. It's incredibly balanced for a big-bodied acoustic guitar. Specially braced to respond to a light touch, the Grand Orchestra is a good fit for players who want the richest, most powerful acoustic voice, for players who like a voluptuous, Jumbo-size guitar, and for solo performers looking for an expansive palette of sonic colors and textures. A guitar's top is the primary filter and distributor of vibrating string energy through the guitar, which means it has a huge impact on its sound. Sitka Spruce is the most prevalent guitar top wood of the modern era. It blends stiffness and elasticity in just the right proportions which translates into broad dynamic range with crisp articulation. Solid Indian rosewood back and sides complement the Sitka top with sound that's made it one of the most popular tone woods ever. Rosewood produces the strongest bass response among the tone woods commonly used for guitars, with a slightly scooped midrange. Rosewood's sweeping frequency range - deep lows that assert a throaty growl with sparkling highs - rings out with bell-like, high-fidelity clarity. It yields a full-range acoustic voice with complex overtones and extended sustain. Taylor's ES2 is a revolutionary pickup design that delivers the latest in Taylor’s ongoing innovation in acoustic guitar amplification. The heart of the Expression System 2 is Taylor’s patented behind-the-saddle pickup, which features three uniquely positioned and individually calibrated pickup sensors. Because the pickup doesn't sit under the saddle, the bottom of the saddle comes in full contact with the bridge, allowing all the nuance of the guitar's tone to come through clearly whether playing acousticly or plugged-in. The location of the sensors enables a more dynamic range of acoustic sound to be captured than ever before while playing plugged-in. Together with Taylor’s custom-designed “professional audio”-grade preamp, this system produces exceptional amplified tone and responsiveness. On stage through a PA, plugged into your favorite acoustic amplifier, or direct into recording software, the Expression System 2 faithfully conveys the voice of your Taylor guitar. The Taylor Expression System 2 operates through a proprietary 9-volt battery compartment and easy-to-use volume, and active bass and treble controls. Custom-calibrated wood thicknesses and bracing for each body shape, 3.5 mil finish thickness, protein glue (bracing and bridge), rosewood pickguard, rosewood top trim, single ring abalone rosette edged with rosewood, pearl "Element" fingerboard inlay, maple binding (non-figured). What sets Taylor Guitars apart? Unmatched build quality, the most stable and playable necks, a vast array of tonal options, eco-conscious and ethically-sourced raw materials, and a lifetime of service and support.